Views in the form of tables can be considered the most commonly used UI elements in Oro applications. They are interactive, as they not only display data about specific store records but contain links to these records’ pages. Views are also configurable – so you can adjust the appearance and contents of the tables to your taste and needs. Such tables represent aggregated views of data and store records, making it easy to locate and manage records, with every grid page functionally tailored to the type of information it represents. In the top left corner of the view page, you can see where the current page is located in the menu. The name of the selected view table is usually located in the row below. Sorting options are located on the left of the view page under the view table name below the filter. 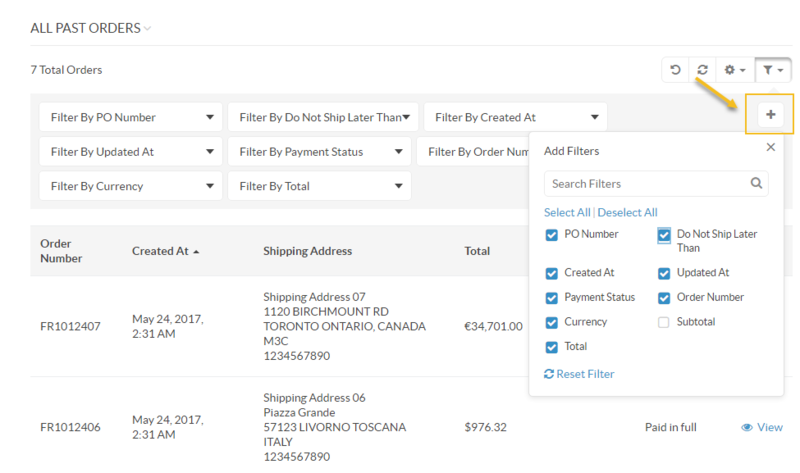 They allow sorting records alphabetically, by price, relevance, or other attributes related to the products displayed on the page you are viewing. Layout options are located on the far right under the view table name. If you have a lot of records, they all may not fit on one data page. In this case, use the pager block in the center above the view table. In the pager block, you can see the page that you are currently on, the total number of data pages and the total number of records in the view table. You can navigate between pages using the < Prev and > Next page buttons. To open a particular page, type its number in the field that displays the current page and press Enter. A saved view is a table with applied filters or custom orders. The default table view is what you see when you open a view page, it shows unfiltered data. To view the list of available tables: click on the arrow next to the table name. To save a table as a new one: click Save as New. Enter New List Name: Define a name of the new view table. Set as Default: Select this check box to set the new table as the default one. Add: Click Add to add a new saved view table. Cancel: Click Cancel to exit. Action buttons are on the right of the view page. They enable you to perform a number of actions with records. The set of such buttons varies depending on the type of the view opened. Refresh the view table: click to update the view table. Reset the view table: click to clear view table customization and return to default settings. Reset applies to all filters, records per page and sorting changes that you have made. To show/hide all columns in the table, click Select All/Deselect All. To clear customization, click Reset. To change the order of the columns, click the ellipsis icon next to the name of the column you wish to move, hold the mouse button, and drag the column to the required position. Filters: click to show/hide filters to select specific items to be shown in the table. More information on filters is provided in the Filters section below. Note that not all filters may be visible by default. To add, remove, search or reset filters, click and perform the required action. To apply a filter, click on its button in the bar and select the required option from the dropdown list. or remain visible but disabled depending on the website configuration when no items matching selected attributes in filters were found. Another way to apply a filter is to click on its button and specify your query in the control that appears. Note that filter controls might look different depending on the type of data you are going to filter — whether it is textual, numeric, date or option set. After the filter is applied, its query will appear in the control, so you can easily recall how you have filtered the data. Filter controls may be hidden at all if there are no related products on the displayed page. If you wish to reset all applied filters, click x Clear All Filters. View tables usually contain one or more options applied to specific records within them. These options take the form of individual icons or icons within the ellipsis menu that can be collapsed. The types of options available are subject to the type of data contained in the table and to the system configuration. 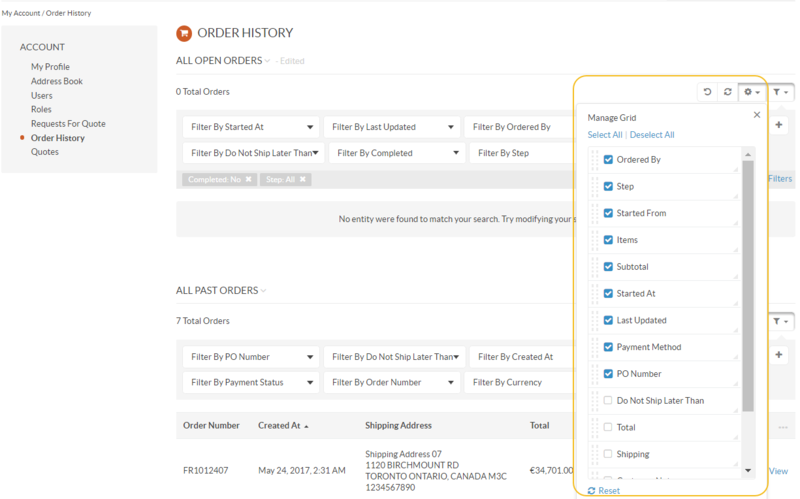 With mass actions, you can apply one action to multiple items at the same time, which can simplify and speed up the process of selecting the required items. 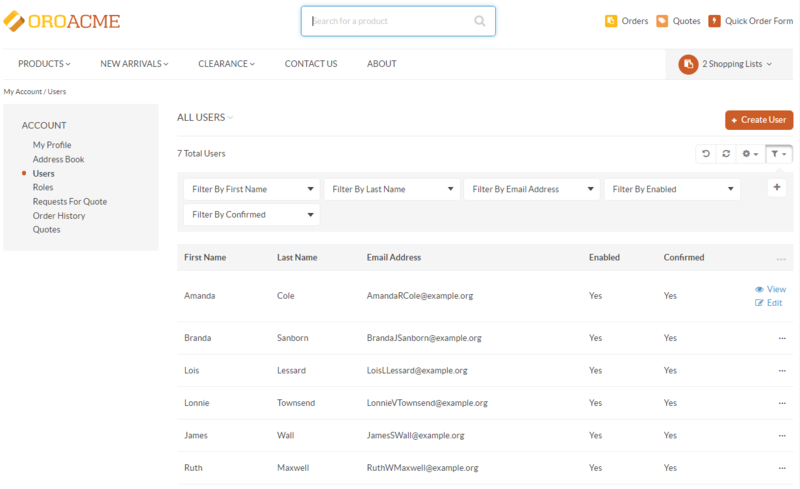 In the storefront, mass delete action is available in the Address book and Users sections only for the registered users. Navigate to the account page by clicking Account at the top. Click the Address book section. 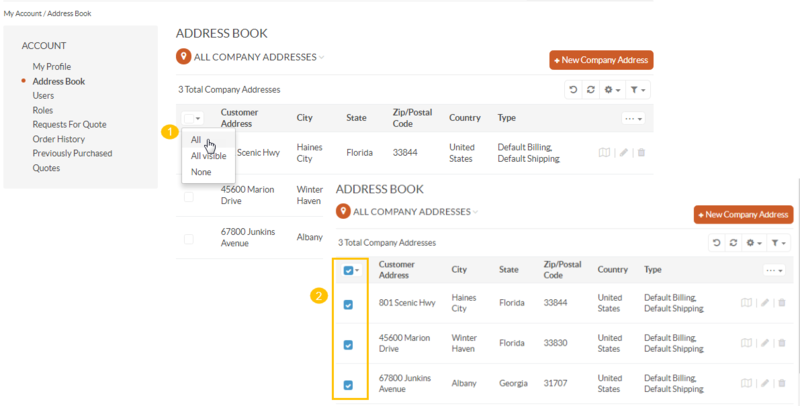 To select multiple customer addresses, click in the left corner of the list header. The All option enables to select all the addresses available under this section. The All visible option enables to select only the addresses visible on the page you are currently viewing. The None option enables to deselect all the addresses which were selected previously. Hover over the More Options menu at the end of the list header and click Delete to delete multiple addresses at a time. Type in the search key into the text field.